YANGON - First there was beer and paddleboard yoga. Then someone added goats to the mix. Now fitness buffs in Myanmar are taking the latest body-bending trend to whole new heights -- pulling off yoga poses on a climbing wall. Khin Myat Thu Zar zips up to the top of a wall at a newly opened climbing centre in Yangon with ease. But her climb isn't finished yet. With the support of a rope partner she flips upside down, her feet gripping two climbing wall holds in an inverted split that would make the couch potatoes of the world wince at just the thought. "Much more strength is needed to do this kind of yoga and the mind has to be entirely stable," she told AFP after a climb intermixed with an array of elaborate poses. "You need to be courageous," she added. The 32-year-old former lawyer has been teaching yoga in Myanmar professionally for the last five years. She started climbing six months ago as a way to strengthen her muscles and decided to marry the two hobbies together. "The feeling on the wall is very different from (yoga) on the ground," she beamed, while admitting climbing yoga was not for the faint hearted and carried some risks. "If we do something wrong, it can hurt and it is dangerous." Most of her students hail from Myanmar's rapidly growing middle classes, who have been devouring global trends since the once isolated country abandoned outright military rule six years ago. Lifestyle options that many in the west might have taken for granted -- from fast fast food joints and hipster cafes to nightclubs -- are still seen as novel in Myanmar. Now yoga studios, climbing walls and tight-fitting gym clothes, trends almost unheard of under cloistered military rule, are breaking through. "Things are changing," Khin Myat Thu Zar said, when asked whether the skin-tight gear turned heads in a country that remains deeply conservative and where women are not encouraged to show flesh. 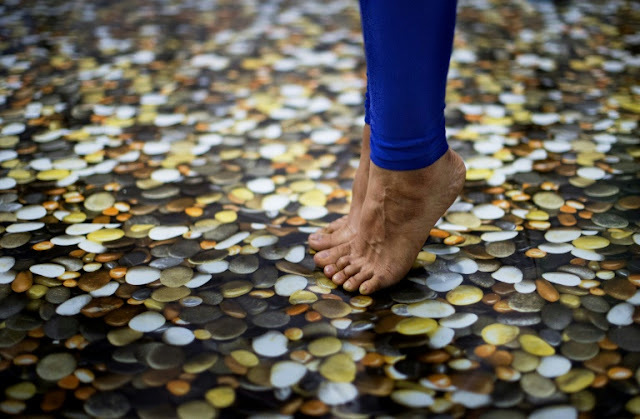 At for an hour long session, climbing yoga classes are inevitably only affordable for the wealthy in Myanmar where the average annual salary is just $1,250. "Sportswear fashion is a new trend now in Myanmar," she explained. At $12 for an hour long session, her climbing yoga classes are inevitably only affordable for the wealthy in a country where the average annual salary is just $1,250. But there is no shortage of willing participants. At a recent session, some half a dozen women and two men warmed up before trying their hand at various yoga position on the wall. 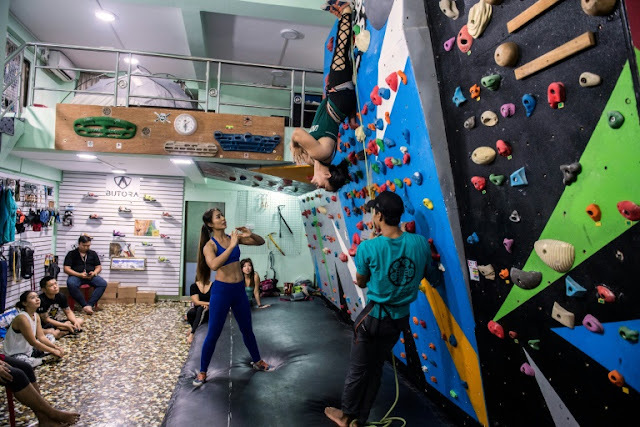 Myint Myat Sandy, a 25-year-old student, said she wanted to use climbing to boost her fitness and improve her yoga skills on the ground. "The way we do climbing yoga, it builds up strength in your hands," she said. Sandar Win, a bodybuilder in her 40s, says it is inner peace she is after. She explained: "I love the feeling I get at the end of a yoga session. My mind is totally at peace." First there was beer and paddleboard yoga. Then someone added goats to the mix. Now fitness buffs in Myanmar are taking the latest body-bending trend to whole new heights -- pulling off yoga poses on a climbing wall.